The exceptional 1911 coronation crown of Queen Mary, set with over 2,000 diamonds, contained three unique diamonds that could be removed and worn separately as magnificent pieces of jewellery. These included the celebrated Koh-i-Noor and the larger cuts from the internationally famous Cullinan Diamonds. This lavish collection is inspired by one of the most unquestionably grand crowns in royal British history. 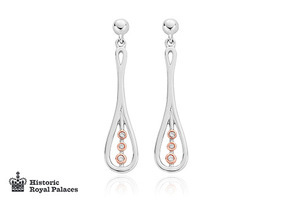 The sublime silver and rose gold earrings contain rare Welsh gold and are set with six sparkling diamonds.